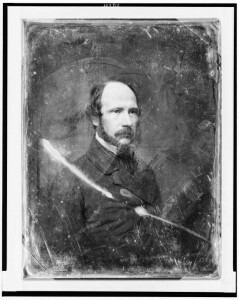 Almost immediately the code and its chief draftsman, the Manhattan commercial lawyer David Dudley Field, became famous across the common law world. For the first time, a common law jurisdiction entirely abandoned the forms of action, insisting that parties need not conform to a small menu of stylized forms, but could plead the facts concerning their case and the desired remedy. The code introduced such features of modern American practice as the contingency fee and lawyer-controlled pretrial discovery practice. It deregulated lawyers’ fees in New York, bringing a “free market” economy to the legal profession. Further, the code allowed parties to testify in their own causes, joining the few states that had just recently adopted this rule that would soon revolutionize the law of torts. Most importantly, the code accomplished these things as a code, a lengthy yet systematic piece of legislation that became far and away the longest statute in America (even the truncated procedure code was significantly longer than the early penal codes). Even without enacting the final draft, New York proved what could be accomplished through a bureaucratic lawmaking process, the dominant source of American lawmaking in the following century. Over the course of the next several decades almost every state eventually adopted the Field reforms, eliminating their courts of chancery (equity) and requiring “fact pleading,” party testimony, and unregulated lawyers’ fees. 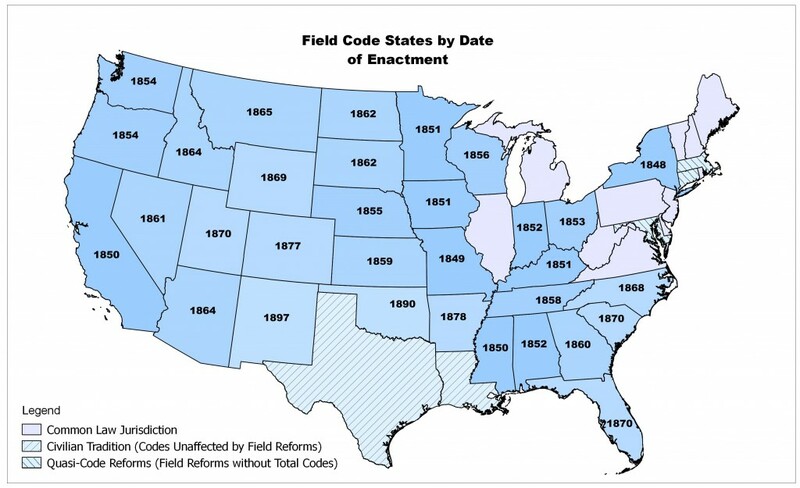 Some states adopted their reforms piecemeal, but most enacted codes of their own, often following one or another draft (but usually the later, complete draft) of the Field Code. Map adapted from Charles McGuffey Hepburn, The Historical Development of Code Pleading in America and England (1897), rendered with QGIS. In some cases, we know how closely another state followed New York because the code commissioners of the borrowing state tell us so. Otherwise, scholars to this point have had to rely on impressionistic evidence to conclude that the Field Code was the dominant influence on American procedure before the 1938 Federal Rules of Civil Procedure. Each code is hundreds of sections long, and oftentimes hundreds of pages as well. Figuring out where innovations or alternate sources of influence have arisen in such a mass of text has been impossible until very recently. A number of digital tools can now help us to be more precise about they ways legislatures borrow from and influence one another. Though my project concerns the Field Code and American procedural law, the processes I describe could be productively applied to any set of American statutes, such as the Married Women’s Property Acts, the postbellum southern Black Codes, or the emergent administrative statutes such as workmen’s compensation laws. Almost all nineteenth-century statute books are now available for free download from Google Books, meaning digital images of the practice codes are easy to secure. After OCR-ing these images and doing a little work to de-clutter the result, we will have a set of texts that we can then compare using the open-source statistical language R. We can then trace direct borrowings from code to code, testing the influence of New York. More importantly, we can see if other significant influences emerge, and I suspect we’ll see regional centers of influence (e.g., the Intermountain West likely borrowed its text not straight from New York but secondhand from California) and second generation innovations in practice, allowing us to see at a glance where significant pioneering work was down outside of the notoriously conservative jurisdiction of New York. In the following months, I will be posting updates on the project and examples showing what digital tools are proving most helpful in tracking legislative influence across the country. This entry was tagged Field Code, optical text recognition, R, textual comparison. Bookmark the permalink.